Founded by the legendary Maharana Udai Singh in 1559 A.D. on the banks of Lake Pichola, Udaipur is one of the most romantic cities in Rajasthan. 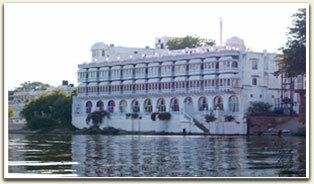 Also known as the city of lakes, Udaipur gleams in its abundance of lakes, marble palaces and picturesque gardens. A legendary Haveli standing on a peaceful island "Bramhapuri" on the western Banks of Pichola Lake, Overlooking the magnificent city palace. The oldest jagdish Temple ,Bathing Ghats and Embankments.West Zone culture Center of India which happens to be historical Bagore ki haveli is also situated on the opposite ghat.